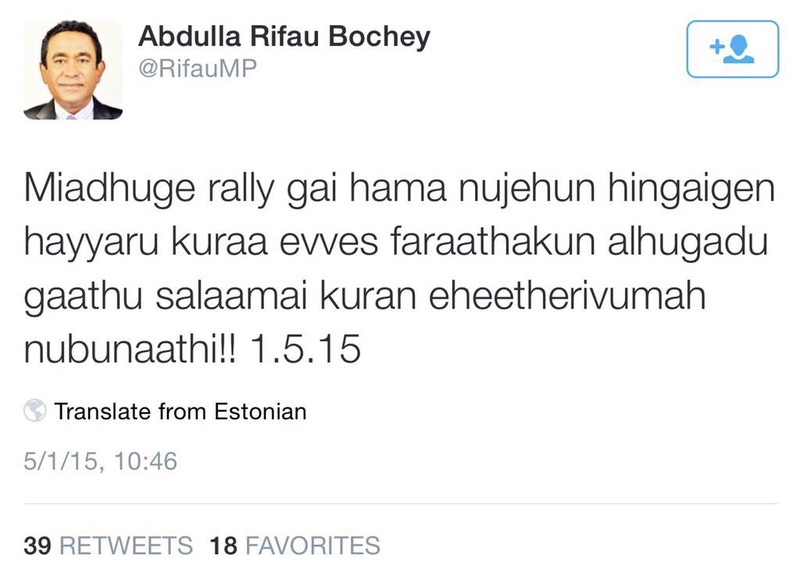 Ibra’s tweet when the protests began on 1.5.15. Moving! Vote in a government. Give them a year or two. Take to the streets. Mount the pressure. Topple the elected leader. Change government. Rinse and repeat as needed. This is a formula that Maldivians seem to have taken to like a duck to water, and it has got to stop. This is exactly what President Nasheed warned us about when he was toppled from power through a coup d’état on the 7th of February of 2012. Believe it or not, pose your various excuses or not, it was indeed a coup, brought about with the aid of the mutinying police and military officials. This sentiment becomes fact when you take into account the recent MayDay rally or #EkehFaheh15 as it was referred to in social media circles. Government vehemently denied that there existed any pressure, but press conferences and tweets from government aligned MPs and bots attested to fact that government was indeed jittery. 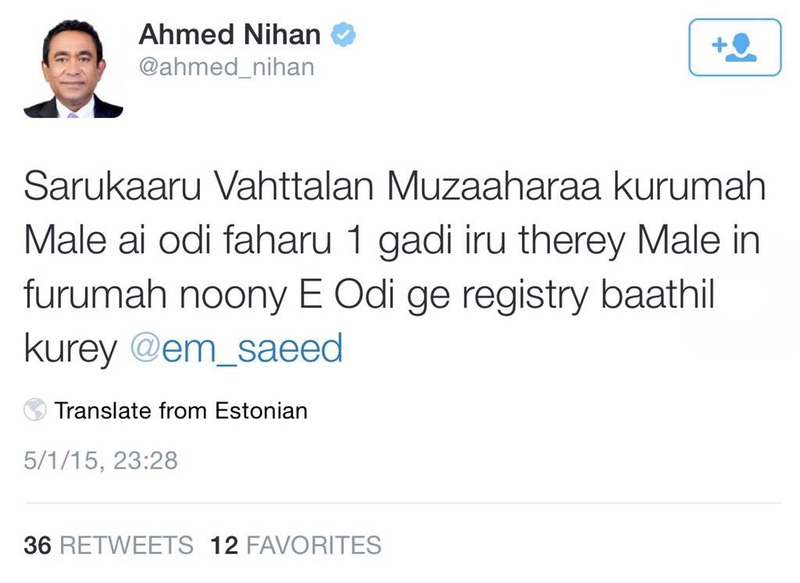 Government MP Nihan threatens boat owners who ferried people to Male’ for the protest. Yet, after brutal crackdowns on protestors, the rally ended with the state marking its victory with fireworks the very next night. The government remained unchanged unlike the culmination of events of 7th February 2012. MP Nihan called out to terminate those that are sympathetic to the oppositions cause from their government jobs & for the boats that carried people to the protests from the islands to Male’ be cancelled of their permits to travel. But there definitely was no pressure. The art of changing governments via coups is not something that is new to the Maldivian history. This has happened many times before and is set to continue unless the elected governments are ready to listen to its people and work with them to ensure harmony and development that is beneficial for the people, not just to a couple of ‘loyalists’ to the leader in power. The blatant disregard to the people is shown more so when the opposition continues to talk about Tourism Minister Ahmed Adeeb’s corruption and stronghold on the government & the President telling the opposition that Adeeb would be the one who would represent him in any negotiations or meetings that would take place with the opposition movement. 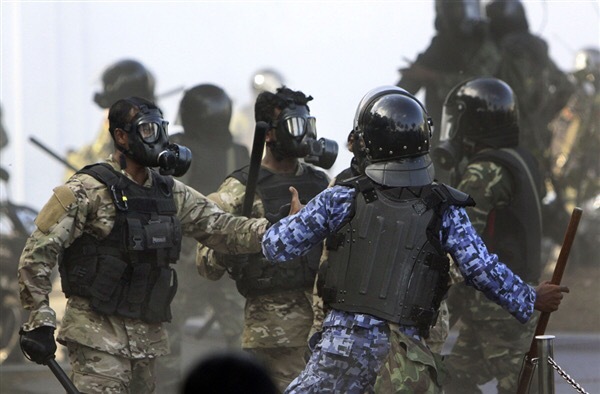 Prior to 2008, Maldives has weathered through tough 30 years of torture and fear where if your family member even expresses a desire to see a different leader take over was jailed & tortured, coming out from the experience a shell of the person he or she was before. Oh how well the people have forgotten. I weep over the many accounts that remain untold even today, of the many ways in which President Maumoon’s regime ruined the lives of families by rendering a person unfit to even take care of personal needs after being taken in for reprogramming at the infamous jails in Dhoonidhoo. All that changed through nonviolent political movements that wasn’t easy, and yet Maldivians persevered. Yet again today we are sliding rapidly into the same rut, unless the government acts to rectify their mistakes & the people raise the collective voices to end this tyranny. President Nasheed calls for perseverance from his jail cell where he is set to spend the next 13 years of his life, all because he wants a life of dignity and equal rights for the people of the Maldives. 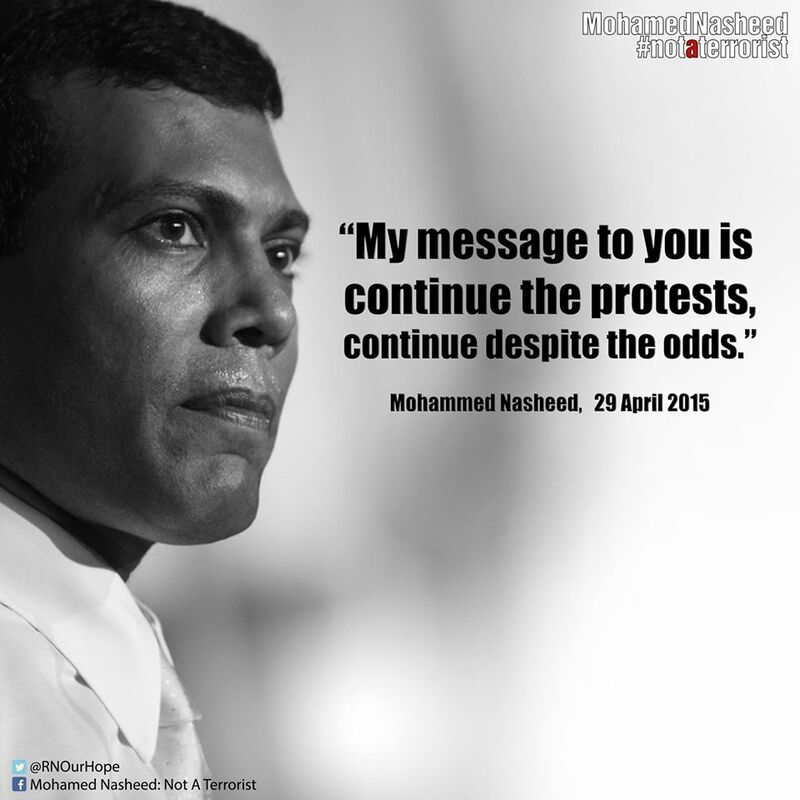 President Nasheed’s message to the people. It was quite obvious that during the MayDay rally, the police targeted the vocal on social media and otherwise, the ones who dare criticize the government and its actions or lack of without fear. A prime example would be Hamid Shafeeu, a staunch supporter of democracy and its values, whose wife was snatched first which ultimately led to his arrest during the next couple of minutes. Arrests numbered in the 100’s before the night was through and none of it was easy to watch. 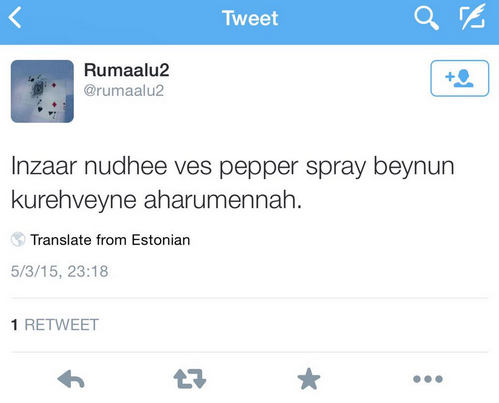 Sentiments of a government supporter; their government doesn’t have to warn protestors before pepper spraying! The fear and intimidation that we thought ourselves rid of is back, and if I have to put my money’s worth on it, I would say it is back to stay. Accounts of civil servants and other government employees being threatened with dismissal or worse if they took part in the protests continue to pour in and I for one have this foreboding we are headed towards the era where we would have to huddle in fear every second of the day. I can never be a supporter of a coup d’état that topples a government. But just like the CoNI report that actually legalized this form of government change if there exists the weight of a couple of hundreds of citizens behind the movement, then I guess there’s no reason that a government cannot be changed legally in the said manner. But deep in all of our hearts we know that ain’t right. We know that the power lies within the people who cast their votes to decide who their leader should be for the next FIVE years. Not ONE or TWO or even FOUR, but FIVE. Let us not forget that. Nor should the government ever forget that they are elected to do RIGHT by the PEOPLE. Not by those that work their own agenda, filling their pockets with the taxpayers money, making the best of it while their government thrives. My wish for the Maldives and its people is a simple one. 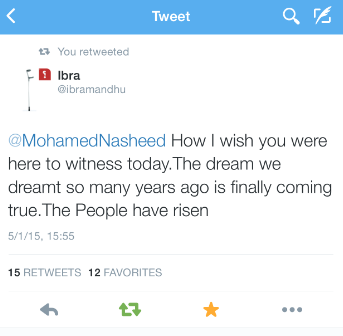 One that aligns with the vision that President Nasheed has for this country. That we be able to live a life of dignity regardless of our ideological differences. That we be a nation that prospers amongst a just and able society wherein which the government doesn’t serve its people based on their political color of choice. A government which listens to the concerns of the people who put them there, without openly challenging them and calling for war. From the manner in which things have proceeded since the elected president was toppled from power back in 2012, little remains of the democratic changes that were brought about owing to the new Constitution. What remains or is in the process of happening is silencing the voice of dissent, the vocal who are not swayed by the threats this government, it’s MPs & associates seem to dole out on a daily basis. With the leaders of the opposition behind bars, perhaps to be prosecuted & doled out with equally horrific sentences as given to Nasheed, Maldives is on the verge of becoming the next Egypt. The government is adamant that its foreign policy reflect this tyranny and that is exactly what’s being conveyed through the diplomatic channels. The single flickering light of hope at the very end of the long winding tunnel remains on the international community, the actions that they would be willing to take to put this tyrannical government to bed. Future of the country looks bleak, no matter in whichever direction you look at. The struggle that is currently ongoing, the people trying to let their voices be heard to a tyrannical government that not only actively challenges the people, but also celebrates with fireworks their “victories” over the people doesn’t seem promising. Inevitable seems the breakout of a civil war, rendering this country totally unlivable. On the surface, the scars left over by the coup might have scabbed over, but inside the wounds are deep, festering with hatred, resentment and a deep disillusionment over a country whose justice system continues to fail the public over and over again. And as every infamous quote tells us, only time alone will tell whether those fighting for rights, justice and democracy would emerge victorious or whether we’d all be browbeaten to embrace a culture of corruption, nepotism, injustice & abuse for years and years to come.